B ut to ns u p at t he f ro nt w it h a ti e detailas well lo ve ly l ig ht weight fo r th e su mm er. Condition is Used. 18 M & Co top blouse T Tee. scoop neck. soft stretch viscose jersey. May 21 - 27. back length 27". July 16 - 22.
ladies short sleeve blouse-with belt, pleated bib front size 18. M&Co, Condition is Used. Dispatched with Royal Mail 2nd Class. Green cotton Top. 100% Cotton. Don't miss ! M&Co check cotton long sleeved shirt. Front button fastening and on cuffs with pretty pearl shell look buttons, 2 breast pockets. PRETTY RED FLORAL CRINKLE EFFECT COTTON/POLYESTER. M & CO BLOUSE. APPROX LENGTH 23". SIZE UK 18. M&CO spirit range size 12 long sleeved top, button down front, pintuck detail, vgc. 100% Linen.Two breast pockets. Button down. Roll tab sleeves. Button cuff. Relaxed fit ( not fitted ). Contains natural slubs in the material. Pit to pit 20". Nice quality shirt. The colour is a soft white rather than a bright white, and the top has ribbon and ruching detail on the front, as well as ribbon edging around the neck and front. 100% cotton. Machine washable. A very handy Purple Cotton Top from M&Co. for sale …. favourites list. Pit to pit 23”, Length 31"
GORGEOUS M&CO MINT GREEN TOP WITH BUTTONS AND SEQUINS ON THE FRONT - TIES AT THE BACK AS PICTURED. EXCELLENT CONDITION. Lovely M& Co Blouse Size 16 Multi White Blue Red Flower Pattern Chest 40" - 42"
Lovely blouse shirt top. underarm to side seam length 14.5" back of neck to length nr 28" underarm to sleeve length nr 17" Adjustable can be turned up and button fastened to 3/4 Sleeve button fastening to longest point on cuff also. The fabric is 100% cotton. Style: Blouse. Denim Waistcoats. Denim Jackets. Pattern: Floral. Size Guides. Main Colour: Teal. Material: 100% Cotton. PRETTY TURQUOISE STRIPED COTTON. PIT TO PIT 26". M & CO BLOUSE. LENGTH 27". SHORT SLEEVES. BNWT RRP £25. MID DENIM BLUE SHIRT. 8 BUTTONS TO FRONT. 1 ON POCKET. ARMPIT TO BOTTOM 40 CM MIN. MACHINE WASHABLE AT 40 DEGREES. SHOULDER TO BOTTOM 72 CM. 128 CM AROUND BUST. It has a little gathering to the shoulders. It has a large appliqued white lace bow to the front. The original, listed, price was £20. 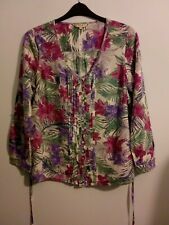 Lovely blouse BNWT. Length from back of neck to hem 30". Chest size approx. 48"across. IT HAS V SPLIT ON THE CUFFS, BUTTON FRONT, RUCHED EFFECT AROUND BUST AND CHEST AREAS. HERES A TOP FROM M&CO, THE LABEL SAYS SIZE 18. I WAS SIZE 14 WHEN I BOUGHT IT AND IT FITTED JUST RIGHT, IM SIZE 16 AND CANT GET INTO IT, SO ITS NOT AN 18 ! Ladies top size 8. Condition is New with tags. Bow detail. Shoulders 39 - 40 cm. Sleeves 60 cm. Length 73 cm. Pit to pit 58 cm. BNWT - originally cost £20. This is a gorgeous top from M&Co. States Dusty Pink on label. 15 1/2” down side seam from underarm seam. This top from M&Co is a raspberry pink 100% cotton fabric, and it has a boho style. It buttons partway up and has a spare button on the label. Soft jersey fabric. This is a really lovely loose fitting top. The fabric is lightweight and does not stretch. It has lace trim and a frill front. You will probably need to wear a vest top under it. All faults are clearly described.